Check in area in the new terminal opened in 2017. Helikopter Service established itself at Flesland in 1958, two years after the Stavanger-based company was established. The same year Vestlandske Luftfartsselskap filed for bankruptcy and Ålesund Airport, Vigra opened. Thus Braathens SAFE was awarded the concession for the route Stavanger–Bergen–Ålesund–Trondheim. Both SAS and Braathens were granted concession to operate the route from Kristiansand via Stavanger to Bergen. The same year a new terminal building opened. With the delivery of DC-8-aircraft, SAS started a direct service to New York. Fornebu had too short a runway to handle the DC-8, so Flesland became the main intercontinental hub in Norway. Another important factor during the 1960s was the low range of the aircraft—thus Bergen was a stop-over for aircraft from Stockholm and Copenhagen. Later the route was taken over using the Boeing 747. SAS started a direct service from Bergen to Tromsø in 1965. Kristiansund Airport, Kvernberget opened in 1970, with Braathens SAFE receiving the route concession from Bergen. Two years later, in a national realignment of concessions, SAS lost their right to fly to Tromsø. Instead Braathens SAFE was granted the right to fly from Bergen via Ålesund, Kristiansund and the newly opened Molde Airport, Årø to Bodø and Tromsø. The airport has a single 2,990 by 45 meters (9,810 by 148 ft) runway numbered 17–35 (roughly north–south). The runway has 7.5-meter (25 ft) shoulders on each side and has 2,450 meters (8,040 ft) between the touchdown points. The runway has a parallel taxiway (Y), with nine intersections. There is also a taxiway further in along between the terminal and technical area (W). There are six intersections between W and Y, one of which leads to the military area. There is instrument landing system (ILS) category I on both directions. The airport has an airport surveillance radar; there are both a surveillance radar and a backup radar located on Sotra. The runway has a capacity of maximum twenty landings and twenty departures per hour. In 2011, the route Oslo–Bergen had 1,680,000 passengers, making it the second busiest route in Norway (after Oslo–Trondheim). It was in 2007 the seventh-busiest route in Europe. 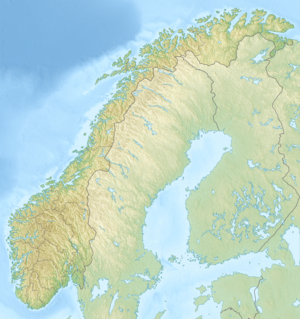 The routes from Bergen to Stavanger and Trondheim are the busiest routes in Norway which do not operate through Oslo. Norwegian and SAS nearly split the Oslo market evenly, although SAS has 54 percent of the business market and Norwegian 58 percent of the leisure market. Since 2003, the percentage of passengers traveling from Bergen who are dependent on transferring abroad before reaching their ultimate destination has fallen from about 60 percent to below 40 percent. Avinor is currently in the final stages of building a new terminal building immediately southeast of the current terminal. Based on a design by Narud Stokke Wiig Arkitekter og Planleggere (now Nordic — Office of Architecture), it is scheduled for completion in 2016 and is estimated to have sufficient capacity until 2026. The new terminal will have an area of 78,000 square meters (840,000 sq ft) and have a capacity for 10 million annual passengers. In addition to larger terminal capacity, it will give the airport six new gates. The price is estimated at NOK 2 Billion and will also include an expansion of the Bergen Light Rail to the airport. ^ "Color-avviklingen: – Som en bombe på de ansatte" (in Norwegian). Norwegian News Agency. 27 September 1999. ^ Lillesund, Geir (10 March 2004). "Lindegaard: – Vi plukker det beste fra SAS og Braathens" (in Norwegian). Norwegian News Agency. p. 24. ^ "Regionale flyruter: Tildeling av 18 flykontrakter – økt kapasitet og ny rute" (in Norwegian). Ministry of Transport and Communications. 19 January 2012. Archived from the original on 2 October 2012. Retrieved 2 October 2012. ^ "World Airliner Census". Flight International: 41–63. 19–25 September 2008. Retrieved 21 February 2010. Avinor (2011b). "Avinor Markedsundersøkelse – Reisevaner – Hovedresultater 1. tertial 2011" (PDF) (in Norwegian). Archived (PDF) from the original on 2 October 2012. Retrieved 2 October 2012. This page was last edited on 21 April 2019, at 21:53 (UTC).